Like Character Icons? Click here to view the entire range. 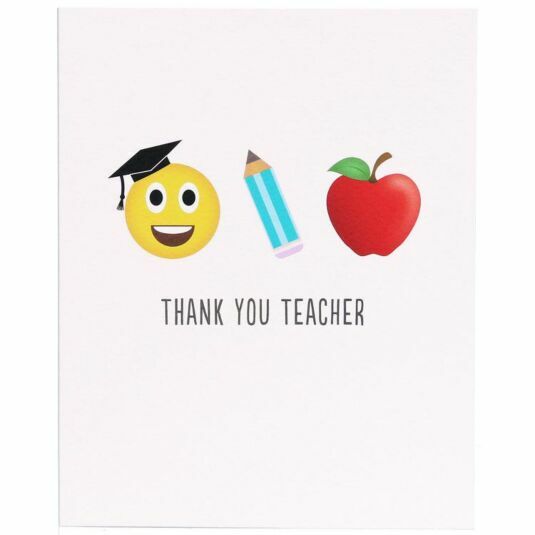 Send your teacher one this fun emoticon card, part of the Fun Faces range from Bluebell33. The front of the card has a white background with three school related emoticons, such as yellow smiling emoji wearing a graduation hat, a turquoise pencil and a red apple. The card is left blank on the inside for your own personal message and comes complete with a gorgeous turquoise envelope.